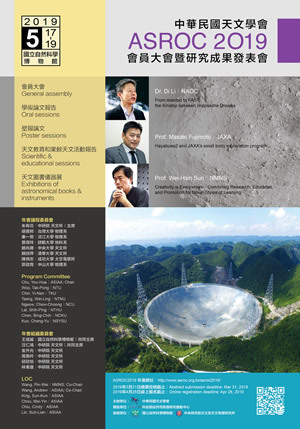 The 2019 Scientific Assembly of the Astronomical Society of the Republic of China (ASROC2019) will be held at National Museum of Natural Science on May 17 (Friday) – 19 (Sunday), 2019. This is an annual event for all astronomers and astrophysicists in Taiwan to present their most recent discoveries and observations, to report their latest research results, to exchange ideas, and to organize collaborations. Oral presentations and conference posters in all areas of astronomy and astrophysics are solicited. ASROC2019 is also an excellent venue for students, in particular graduate students, to present their research findings or progress from their thesis studies. The meeting will include plenary talks, scientific and educational sessions, poster presentations, and a business meeting. The featured plenary speakers are Dr. Di Li from NAOC (Title: From Arecibo to FAST: The Kinship between Impossible Dreams), Prof. Masaki Fujimoto from ISAS/JAXA (Title: Hayabusa2 and JAXA's small body exploration program), and Director-General Wei-hsin Sun from NMNS (Title: Creativity is Everywhere - Combining Research, Education, and Promotion for Novel Styles of Learning). In addition to the scientific agenda, a conference banquet will be held at the noon of May 18 (Sat) and all meeting participants are welcome to attend. After the banquet, you can have group discussions or join us for a group excursion. In the Assembly on May 19, the Society will also present the 6th Heaven Talk Award to National Museum of Natural Science for its outstanding contributions to astronomy education and popularization of astronomy. In addition, the three best student posters will be awarded a NTD5,000 prize and the single best oral presentation will be awarded a NTD10,000 prize. ASROC2019 website is now open for registration and abstract submission. The deadline for online registration is April 28 and for abstract submission, March 31. Participants of the Scientific Assembly should submit their abstracts and register on-line. A registration fee of NT$1,000 (NT$800 for students) should be paid on site. ©2019 ASROC. All Rights Reserved.